The Canterbury-St Martin's hoard is a coin-hoard found in the 19th century at Canterbury, Kent dating from the 6th century. It consists of eight items, including three gold coins. The hoard was found some time before 25 April 1844, when some of the items from the find were first discussed at a meeting of the Royal Numismatic Society by Charles Roach Smith. All that Smith knew of the date when they were found was that it was "a few years since", as he wrote in 1844. 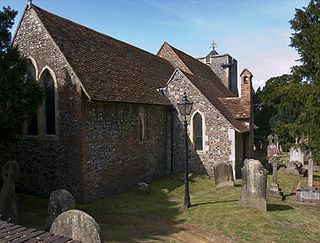 The location of the hoard is usually given as the churchyard of St Martin's Church in Canterbury. However, the first publication about the find, by Smith, states that the find was on the "grounds of the monastery of St Augustine". The objects were acquired by W. H. Rolfe, a resident of Sandwich, Kent in two stages, a first acquisition of three items acquired before April 1844, and five more items procured soon after September 1844. The first three items were first published in 1844 in Collectanea Antiqua, and when the five further items were obtained, that publication was amended to reflect the new items. Smith then published the entire contents of the hoard in the Numismatic Chronicle in 1845. The items in the hoard have been examined by x-ray and fluorescent. The author of this study, S. C. Hawkes, argues that the eight items in the hoard were found in different graves. However, the historian Philip Grierson felt that the possibility of two graves from different time periods both containing coins of the same period was so small as to make the likelihood of the hoard coming from two graves slim. The hoard is the only late-6th- or early-7th-century find of gold jewellery in a grave in a churchyard. All of the coins in the hoard were probably part of a necklace that was buried in a woman's grave. One of the items in the hoard, the Liudhard medalet, is the earliest surviving Anglo-Saxon coin. The first three items listed were the original items acquired by Rolfe, with the others being acquired later. There may have been other items that were found with the hoard, but their identification is not possible. Besides the Oloron coin, which is at the Bibliotheque Nationale, the other eight items are at the World Museum Liverpool. From Rolfe, the eight items were acquired by Joseph Mayer, who gave them to the City Museums of Liverpool, which became the World Museum later. Adby, Richard; Williams, Gareth (2006). "A Catalogue of Hoards and Single Finds from the British Isles c. AD 410–675". In Cook, Barrie; Williams, Gareth. Coinage and History in the North Sea World, c. AD 500–1250. Leiden: Brill. pp. 11–74. ISBN 90-04-14777-2. Blair, John P. (2005). The Church in Anglo-Saxon Society. Oxford, UK: Oxford University Press. ISBN 0-19-921117-5. Gaimster, Märit (1992). "Scandinavian Gold Bracteates: Britain. Money and Media in the Dark Ages" (pdf). Medieval Archaeology. 36. Retrieved 30 January 2010. Grierson, Philip (1979). "The Canterbury (St. Martin's) Hoard of Frankish and Anglo-Saxon Coin-Ornaments". Dark Age Numismatics: Selected Studies. London: Variorum Reprints. pp. 38–51, Corregida 5. ISBN 0-86078-041-4. Staff (2009). "British Antiquities". World Museum Liverpool. Retrieved 30 January 2010. Werner, Martin (1992). "The Liudhard Medalet". In Michael Lapidge; Malcolm Godden; Simon Keynes. Anglo-Saxon England 20. Cambridge University Press. pp. 27–41. ISBN 0-521-41380-X. A bracteate is a flat, thin, single-sided gold medal worn as jewelry that was produced in Northern Europe predominantly during the Migration Period of the Germanic Iron Age. The term is also used for thin discs, especially in gold, to be sewn onto clothing in the ancient world, as found for example in the ancient Persian Oxus treasure, and also later silver coins produced in central Europe during the Early Middle Ages. A sceat was a small, thick silver coin minted in England, Frisia and Jutland during the Anglo-Saxon period. The Church of St Martin in Canterbury, England, situated slightly beyond the city centre, is the first church founded in England, the oldest parish church in continuous use and the oldest church in the entire English-speaking world. As such, it is recognised, along with Canterbury Cathedral and St Augustine's Abbey, as part of a World Heritage Site. Since 1668 the church has been part of the benefice of St Martin and St Paul Canterbury. Both St Martin's and nearby St Paul's churches are used for weekly services. The current rector of the parish is the Reverend Mark Richard Griffin. The tremissis or tremis was a small solid gold coin of Late Antiquity. Its name, meaning "a third of a unit", formed by analogy with semissis, indicated its value relative to the solidus. It was introduced into Roman currency in the 380s by the Emperor Theodosius I and initially weighed 8 siliquae. Liudhard was a Frankish bishop – of where is unclear – and the chaplain of Queen Bertha of Kent, whom she brought with her from the continent upon her marriage to King Æthelberht of Kent. A short ways east of Canterbury he helped found and dedicate to Saint Martin of Tours the first Christian Saxon church in England, St Martin's, still serving as the oldest church in the English-speaking world. Charles Roach Smith, FSA, was an English antiquarian and amateur archaeologist who was elected a fellow of the Society of Antiquaries of London, and the London Numismatic Society. He was a founding member of the British Archaeological Association. Roach Smith pioneered the statistical study of Roman coin hoards. Anglo-Saxon dress refers to the clothing and accessories worn by the Anglo-Saxons from the middle of the 5th century through the eleventh century. Archaeological finds in Anglo-Saxon cemeteries have provided the best source of information on Anglo-Saxon costume. It is possible to reconstruct Anglo-Saxon dress using archaeological evidence combined with Anglo-Saxon and European art, writing and literature of the time period. Archaeological finds have both supported and contradicted the characteristic Anglo-Saxon costume as illustrated and described by these contemporary sources. The Gregorian mission or Augustinian mission was a Christian mission sent by Pope Gregory the Great in 596 to convert Britain's Anglo-Saxons. The mission was headed by Augustine of Canterbury. By the time of the death of the last missionary in 653, the mission had established Christianity in southern Britain. Along with the Irish and Frankish missions it converted other parts of Britain as well and influenced the Hiberno-Scottish missions to Continental Europe. The Liudhard medalet is a gold Anglo-Saxon coin or small medal found some time before 1844 near St Martin's Church in Canterbury, England. It was part of the Canterbury-St Martin's hoard of six items. The coin, along with other items found with it, now resides in the World Museum Liverpool. Although some scholarly debate exists on whether or not all the items in the hoard were from the same grave, most historians who have studied the object conclude that they were buried together as a necklace in a 6th-century woman's grave. The coin is set in a mount so that it could be worn as jewellery, and has an inscription on the obverse or front surrounding a robed figure. The inscription refers to Liudhard, a bishop who accompanied Bertha to England when she married Æthelberht the king of Kent. The reverse side of the coin has a double-barred cross, or patriarchal cross, with more lettering. 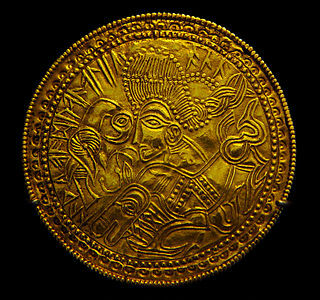 Coinage in Anglo-Saxon England refers to the use of coins, either for monetary value or for other purposes, in Anglo-Saxon England during the early Medieval period. The thrymsa was a gold coin minted in seventh-century Anglo-Saxon England. It originated as a copy of Merovingian tremisses and earlier Roman coins with a high gold content. Continued debasement between the 630s and the 650s reduced the gold content in newly minted coins such that after c. 655 the percentage of gold in a new coin was less than 35%. The thrymsa ceased to be minted after about 675 and was superseded by the silver sceat.